If you�re an avid hunter, or even just go out on the occasional open season, hunting can be both an adrenaline rush and an exhausting experience. Not only do you have to wait for the game to appear and track it after you've made your shot, but you also have to dress it too. Bringing your game back to the homestead, can not only be more exhausting, but not to mention a messy experience. Here at Side By Side Stuff we wanted to keep the hunter, and the UTV enthusiast in mind. That�s why we offer you the Battle Armor Designs UTV Receiver Hitch Deer Hoist, perfect for those riders who also double as hunters. Battle Armor kept the hunter and rider in us all in mind, when they designed this Receiver Hitch Hoist. It can support even the most impressive game, with its all steel construction and 400lb. capacity. The Battle Armor Receiver Hitch Hoist is adjustable, making field dressing game a breeze. With its drop down braces and foot pad, Battle Armor ensures that not only will this hoist help the hunter, but stay stable while doing it. 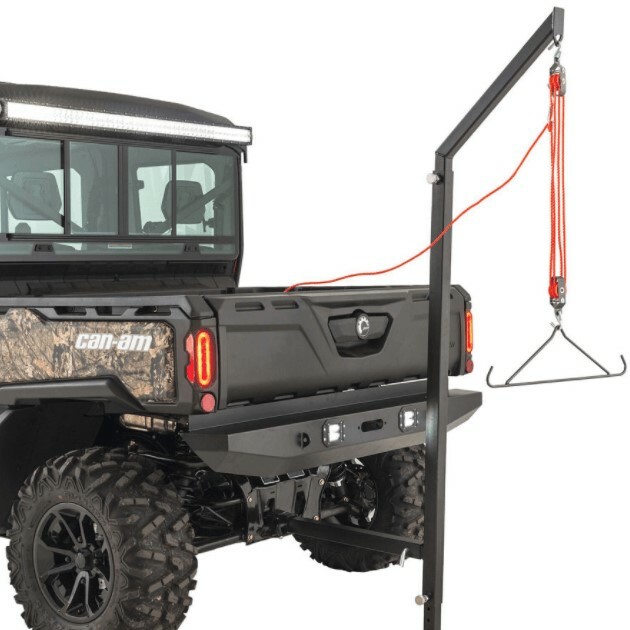 Enjoy your hunt more knowing that you have a helping hand, and order your Battle Armor UTV Receiver Hitch Deer Hoist today!